1 In any free country, people take sides with their ideas. Those with similar ideas group together. Those with similar ideas of how a young country should be run form political parties. 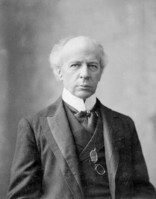 While Sir John A. Macdonald was one of the greatest of the conservatives, Sir Wilfred Laurier was one of the greatest of the liberals. 2 Laurier was born in St. Lin, Quebec, on November 20, 1841. His father was an educated farmer who held public office in their town. When Wilfred was only 11, his father sent him to a neighboring town that was mainly English. There Wilfred stayed with an Irish family. He learned to not only speak English but to understand the English culture. 3 Later on he studied law at McGill University. He set up his law practice in Montreal when he was 23. Soon he also became active in politics. 4 Laurier supported the Liberal party, or "Parti Rouge," that was despised by the clergy. He won a seat in the legislature in 1871 but resigned it three years later.